Audi Q3. The new Q7 focuses the expertise of Audi. Stunned by the fun and variety of choice, the buyer of a new car is rarely asked about the price it will be worth when it comes time to part ways. Oh sure, it will have taken care to choose a diesel engine version, arguing that his natural sobriety increases its appeal on the second hand market. In doing so, the consumer forgets that ease of resale of a model does not prejudice the good performance of its rating. For proof, our colleagues at the weekly Auto Plus report in their annual review of trends in the second hand market that also broadcast vehicles and also ran the compact MPV Citroen C4 Picasso and Volkswagen Touran lose on average 30% of their value as soon as the dealer affix license plates. Older, competitors Peugeot 5008 and Renault Scénic undergo a discount of 38% during the first year of release. Hard. The causes of this dizzying plunge are well known. In a highly competitive market segment, a model arrived late career grants discounts on the sales price that accelerate all his haircut. Still very new, the Citroen C4 Picasso does not suffer from this problem. However, customers may turn away from traditional minivans in favor of compact leisure vehicle that for them the novelty. Here we find the reasons for the success of the Nissan Qashqai, recently renewed, and the Peugeot 3008 and the Volkswagen Tiguan, new favorites families. Those who can afford it run more willingly in Range Rover Evoque in Mercedes-Benz GLA, X1 BMW or Audi Q3. This is one of the champions of the dimension of the occasion, with an average discount of 35% in four years. Instead of only ten months for some competitors. Audi Q3. Q3 exception to the rule that the restyling Audi are discreet, not to initiate the value of the outgoing model. 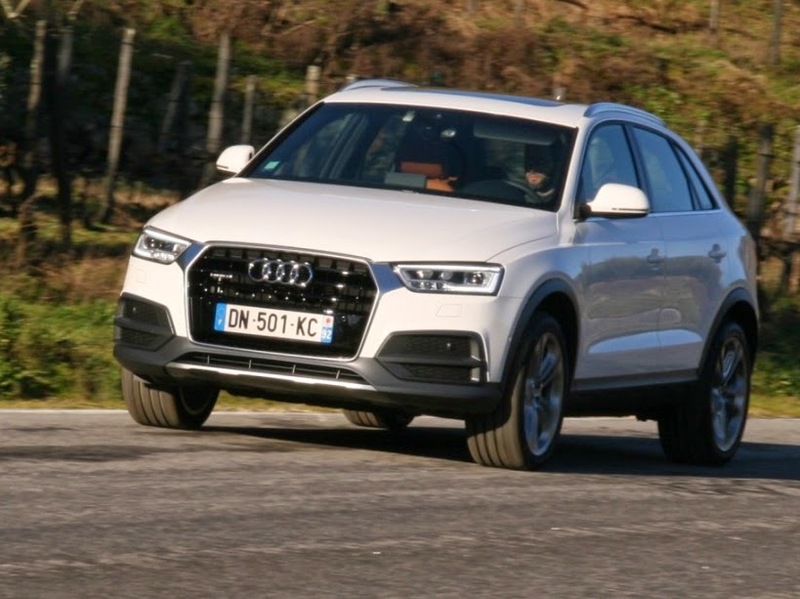 With its popularity, the Audi Q3 could accommodate a cosmetic overhaul at least, like the one advantage the Audi A1. After all, the measured changes contribute to preserve the value of Audi that does not have a reputation for suddenly take a "getting old." Only Ingolstadt thinkers wanted to use this term to mid career to inaugurate series drawing the grille called "advanced three dimensional effect." 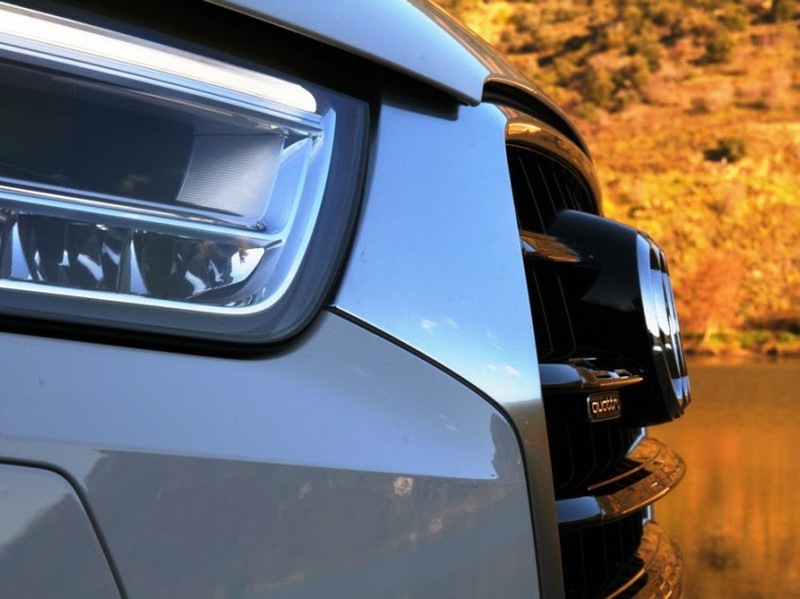 It will be the prerogative of the Audi Q family of the future Audi Q1 the new Audi Q7, through Q3 and Q5 restyled. 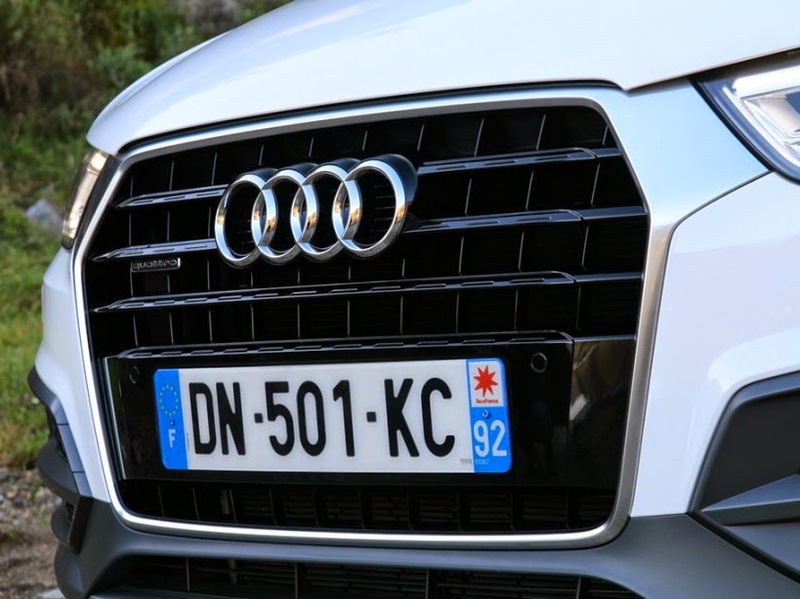 With 7,556 copies last year, Q3 was the third Audi the most sold in France and the fifth in the world. It must be said that France is at the forefront of grassroots movement that promises to bring to 500,000 sales of premium compact SUV segment in Europe in 2015. The Audi Q3 ahead of the Volvo XC60 (76,078 copies against 62 650 ex. ), The BMW X1 (61734 ex.) and the Range Rover Evoque (50,828 copies, source JATO Dynamics). Q3 Audi says will differentiate the style of its SUV. 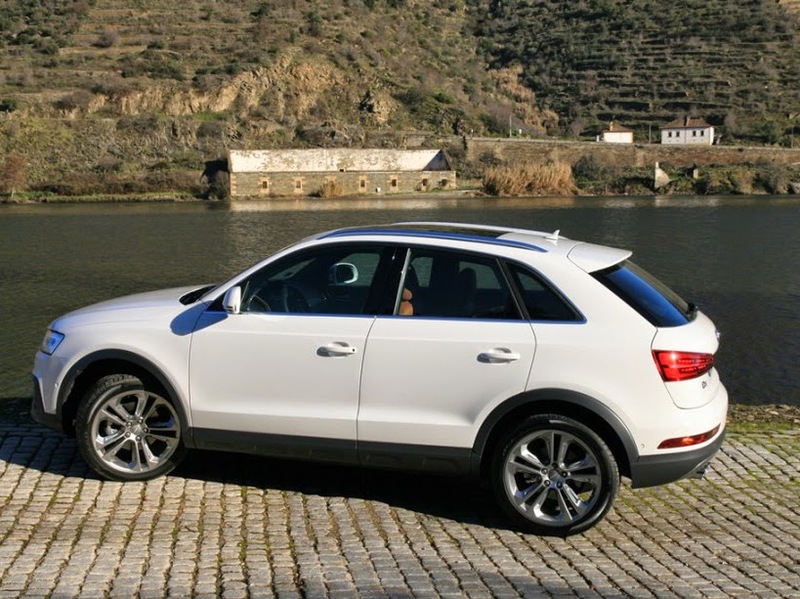 Audi has chosen to anticipate the hardening of malus regime which would have a deleterious effect on sales of the Q3. All versions, the average decrease consumption by 17% at the discretion of the compliance engine with Euro 6. The entry-level, 4-cylinder petrol 1.4 TFSI 150 hp but still shows a switching device wins half the cylinders. Result, falling consumption of 5.9 l / 100 km on average 5.5 l / 100 km for emissions of 127 g / km of CO2 against 137 g / km before. Appreciable. Audi Q3. More remarkably, the 4-cylinder 2.0 TFSI wins ten horses (variants of 180 or 220 hp) while emitting 29 and 25 grams less CO2 per kilometer. Diesel engines also see their CO2 emissions down 10 to 21 grams per kilometer on average despite an increase from July to October horses. All the wicked penalty of more than 2.2000 euros so disappear and most of Q3 are not punished beyond 250 euros. Highest taxed is the Q3 2.0 TFSI Quattro 220 with 1,600 euros. This should contribute to increase beyond the 10% share of gasoline in Q3 sold in France and encourage customers to spend more in their car equipment. Already, the Audi Q3 are controlled to 70% of them in one or other of the two top finishes and Ambition S line Luxe. They are enriched this year with the arrival including intelligent xenon headlights series or, optional on all engines, the robotised gearbox S tronic dual clutch (the equivalent of the Volkswagen DSG). This does not make the Audi Q3 the best balance between price and recreational vehicle market equipment, far from it, but his fellow X1 BMW and Mercedes-Benz GLA prove somewhat less generous yet (click to view rates Audi Q3 2015). A satisfaction that will help get the pill when signing the order, with the certainty of the time came to enjoy this legendary ease of resale.